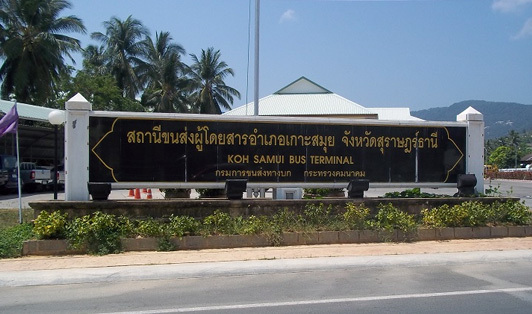 In 2012 in the west of Koh Samui near the immigration office there was built a new bus station. However, up to August 2014 the bus station continued to be based on a "temporary" place, where it was moved to in 2011. In August 2014 there has been a long-awaited move to the new bus station, which from now on will hopefully become permanent. Now most of the buses leaving Samui depart from the new bus station, which is just 100 meters from the immigration office, if going by the road to the Municipal Samui Hospital. This is a departure area for the buses traveling from Koh Samui to Bangkok, Hua Hin, Sungai Kolok and Hat Yai (please do not confuse them with those mini buses from Phantip company which are also traveling to Hat Yai - these would depart from the area in front of the Nathon ferry).